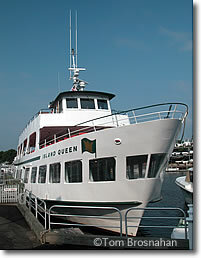 Falmouth's own Island Queen, (islqueen@cape.com, tel 508-548-4800), Falmouth Heights Road, Falmouth MA 02540 operated by Island Commuter Corp, carries passengers and bicycles only (no cars) from Falmouth Harbor to Oak Bluffs on Martha's Vineyard. This passenger ferry sails seven times a day in each direction from mid-June through the first week in September. In early June and mid-September it sails twice a day in each direction during (four times a day on weekends). There are no sailings from late September through May. The voyage takes about 35 minutes, and is usually quite smooth and comfortable. A refreshment bar on board serves snacks, sandwiches, soft drinks, beer, and cocktails. You can also buy Martha's Vineyard tour bus tickets on board. There is even a moonlight cruise on some evenings in July and August. For car ferries to the islands, you'll have to go to Woods Hole. The Island Queen, ready for her morning voyage to Oak Bluffs on Martha's Vineyard.